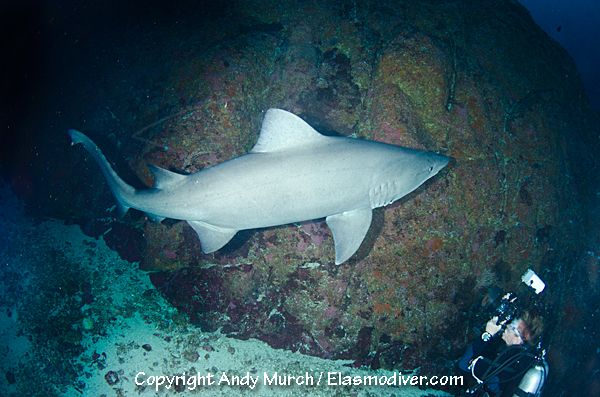 Encounters: Smalltooth sandtiger sharks, Scalloped hammerheads, Silky sharks, Galapagos sharks, Whitetips, Mobula rays, Eagle rays, Whale Sharks and Mantas. Schooling Scalloped hammerhead sharks congregate at various sites around the island. The sharks arrive to take advantage of cleaning stations. Divers hide behind boulders and coral heads trying to avoid being noticed. The hammerheads are generally shy but occasionally come close enough to be seen clearly. Even when they are less cooperative the spectacle of hundreds of Hammerheads swimming by high above the divers is extremely memorable. The hammers are generally thicker in the winter months but this is also the time the poorest visibility. Whitetip reef sharks are present on most dives They are not as common at Malpelo as they are further north at Cocos Island. Silky sharks can sometimes be seen in great numbers. According the Captain of the Inula, every 5 or 6 years the island is visited by schools of silkies that number in the tens of thousands. What a spectacle that would be! Silky shark encounters are more common during the summer months. 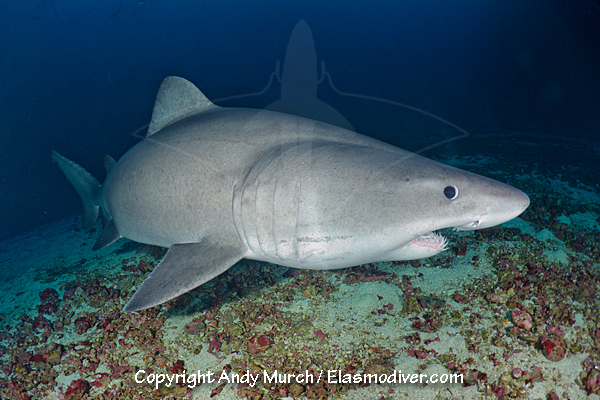 Smalltooth Sandtiger Sharks are seen at very few locations around the world. 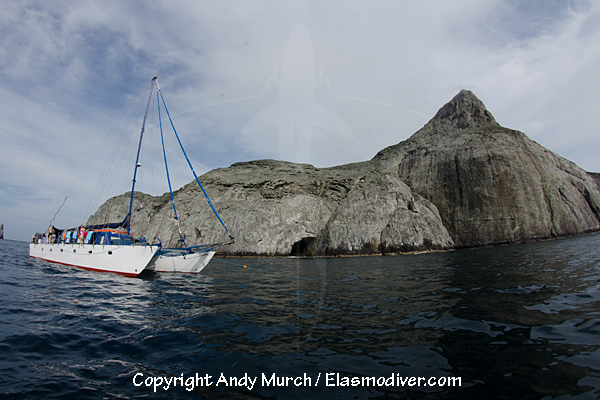 For about a two month span, some time between December and April, a small group congregates at a site named Bajo del Monstruo which is a deep seamount off the north west side of the island. The Inula has about a 70% success rate of seeing these sharks in the right season. Generally there are just two or three but the highest number counted in one aggregation was 17 individual sharks. The smalltooths have been seen as shallow as 30m but they generally remain in 50-65m+. That is far shallower than their usual habitat so it is a great place to see them if you have the training and confidence to go that deep. Bare in mind that the Columbian authorities frown on technical diving at the island so any attempt to encounter them is usually done under the radar on regular scuba gear. Malpelo is a Columbian owned, one mile long, barren rock that rises out of the Eastern Pacific seemingly in the middle of nowhere. 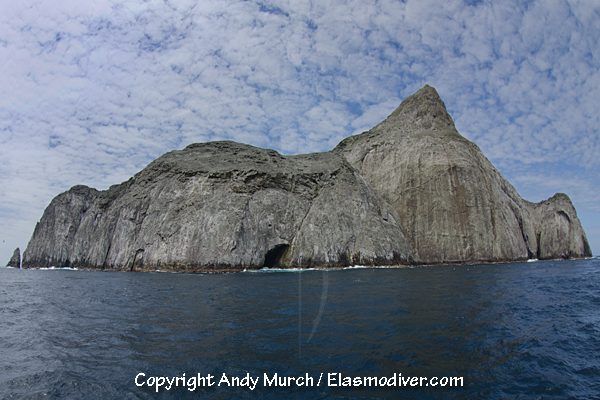 It is the summit of a mostly submerged mountain in a range that also incorporates world famous Cocos Island further north. There is a small Columbian military base on the island. Usually the Commandant allows divers to hike around the rock but the army base changes personnel regularly and some new Commandants are less friendly. 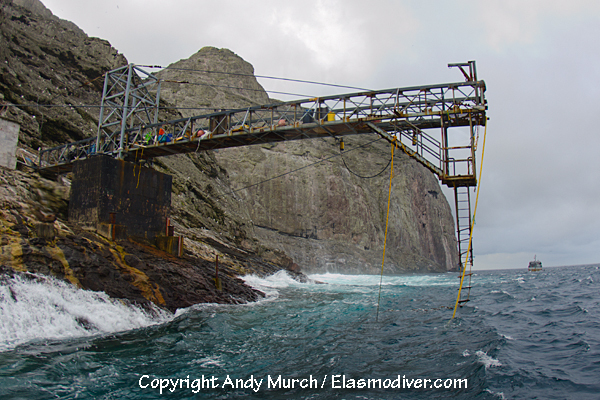 The only way onto the island is via a precarious rope ladder that dangles into the water. The climb to the top of the island is steep and fairly demanding. Malpelo is home to a large colony of red footed boobies and many other sea birds. There are also three endemic species of lizards that call Malpelo home. Accommodation: Ship based only. Malpelo is more than 200km from the port of David. There is another liveaboard that sails out of Columbia. This one caters mostly to South American divers and has a reputation for being rather spartan.